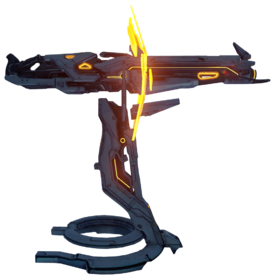 The Z-520 Encounter-Mitigation System (Z-520 EMS), known simply as the Splinter Cannon or Splinter turret, is a Forerunner weapon that saw use during the Forerunner-Flood War and centuries later by Promethean Soldiers, especially the Officer variants, at the outset of the Created conflict. It fires a wide projectile that releases multiple small explosives upon impact that will explode shortly after. Used by Forerunner forces serving in Builder Security during the Forerunners' war with the Flood, the Z-520 Splinter Cannon fires unstable light mass projectiles that ricochet on the ground and break apart on impact, releasing reactive fragments. This design devastated massed Flood infection forms. Seemingly designed for use in quick-reaction and expeditionary military strikes, the Splinter Cannon can either be physically moved to a site by Soldier constructs or instantly called in to reinforce a position by use of a translocation beacon. UNSC forces have only encountered the weapon paired with a generator pedestal, but it is possible there are vehicle-mounted configurations. Absent from use during the conflict on Requiem for unknown reasons, the Splinter Cannon is one of many long-lost weapons that Cortana reclaimed from the Forerunner archives on Genesis. A render of the turret in Halo 5: Guardians. Third-person view of Edward Buck using a stationary Splinter turret in the Halo 5: Guardians campaign. Third-person view of Fred-104 using a detached Splinter turret in the Halo 5: Guardians campaign. The HUD of a stationary splinter turret in Halo 5: Guardians. The HUD of a detached splinter turret in Halo 5: Guardians. A Spartan-IV wielding the splinter turret. A Promethean Soldier Officer using a Splinter turret on Escape from ARC. A Soldier Enforcer with a Splinter turret on Escape from ARC. REQ card of the Splinter Turret.